The Spirit Airlines World MasterCard currently has an Informr score of 6.4 out of 10. This score is based on our evaluation of 7 sources including reviews from users and the web's most trusted critics. Spirit Airlines World MasterCard is typically available to those with good credit scores (650 or greater). Due to the low value of Spirit Airlines miles, there isn't a whole lot of value one can extract from the Spirit Airline credit card. 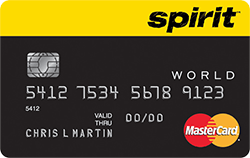 If you enjoy flying with the low-cost Spirit Airlines, the Spirit Airlines World Mastercard could help you accumulate miles toward flights and more. If you’re looking for flexibility in redeeming your rewards, consider another travel card. The Bank of America Spirit Mastercard is a great card for frequent travelers. You may want an additional card to make purchases while you travel due to the foreign transaction fee. If you travel Spirit Airlines frequently and don't mind flying with the basics or putting in a little work to find the best fares and award tickets, you can likely save quite a bit of money with the Spirit Airlines MasterCard. - Also, earn 15,000 bonus miles after your first purchase. 5,000 anniversary bonus miles when you spend at least $10,000 in purchases annually. If you live in an area served by Spirit and you don’t mind flying with a low-cost airline, this could be the rewards card for you. You’ll get a decent sign-up bonus, an anniversary bonus and a generous two points per dollar for every purchase. Despite the reputation of Spirit Airlines, the World Mastercard offers decent benefits for its users. The bonuses do not require the user to spend tons of cash, and the annual fee is the lowest of any airline card.